This article was originally published in Descent no. 190, June/July 2006, page 26. There's more to Bar Pot than the slither through Bridge Hall to the Big Pitch - as the Lancaster University Speleological Society survey showed in the late 1970's, most of this complex system lies hidden from the casual visitor. When the entrance to Bar Pot was opened up in 1949, the routes from Bridge Hall to the Big Pitch were unknown, and the original way on was to crawl through the bedding plane above the Greasy Slab into a parallel system which leads via a couple of climbs and a pitch into Whitehall - an impressive rift passage which emerges at the back of the Big Pitch. 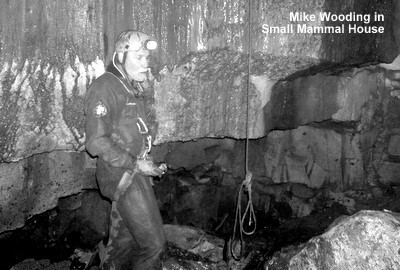 The hydrological origin of Whitehall is Small Mammal House, a chamber discovered in 1976 during the LUSS surveying project (published in 1980). When this was linked to the surface through Small Mammal Pot in 2005, it provided the possibility of an alternative descent of Bar Pot, encouraging people to see parts of the system that they would not normally visit. The route was developed by Mike Wooding and John Gardner using appropriate P bolting. The first part of the trip follows the Whitehall system to the Big Pitch, and then descends the very fine South East Aven. The entrance to Small Mammal Pot lies in a patch of clints, five metres south-east of the starting point for a standard descent into the Bar Pot shakehole. A short drop and a muddy slide over a boulder enters a rift passage which leads directly to the top of the 20 m pitch into Small Mammal House. Small Mammal House was originally named after the piles of bones from assorted small mammals that littered the floor, but these were later buried by digging debris that fell from above. The way on is through a downward constriction into a boulder-strewn descending passage. After a few metres the passage ahead descends a steep boulder slope, at the top of which a passage to the right drops into the attractive Flowstone Chamber (care!). A tight rift leads onto a pitch in the floor of the chamber, but the way on is to climb up over the rift, into a low roof bedding. Immediately after a constriction, keeping to the right-hand wall leads to a wide rift in the floor. This is now on the original descent route of Bar Pot. From here to the Big Pitch, as you shimmy through with streamlined rope bags, spare a thought for the original explorers dragging their rope ladders. The rift is about 3 m deep, and is easily free-climbed. At the bottom, an obscure but roomy hole under the near wall descends a steep ramp to a bedding overlooking a nicely sculpted 10 m shaft. At the base of this is a feet-first clamber over an upright boulder to a 3 m drop into a section of small rift passage, which quickly flattens out into a muddy bedding. A couple of minutes later a long, high rift chamber is entered. This is Whitehall, probably the most impressive section of passage in Bar Pot. It is named after a fine flowstone wall, which, unfortunately has been vandalized by idiots with muddy hand prints. Past a couple of descents, the rift chamber ends in a bedding area, on two levels. Keeping to the upper level and turning left enters a short section of passage which soon drops onto the broad boulder-strewn platform at the back of the Big Pitch. From here, a standard descent could now be made of the Big Pitch, but keeping to the brief of seeing parts of the system not often visited, the route instead follows a protected traverse along a ledge round the left-hand side of the shaft to reach a hidden keyhole passage. This soon ends in another shaft, which is the top of South East Aven. A Y-hang from the roof drops a few metres onto the top of a buttress which divides the deep rift. A traverse over a chockstone floor, and a short climb leads back into the roof where a couple of bolts will be found on the far side of a jammed boulder. These provide a Y-hang for a superb free-hanging descent of the centre of the 28 m shaft, which is considerable more impressive than the neighbouring Bar Pot Big Pitch. It lands alongside the entrance of New Hensler's Passage. This is by no means the easiest, or the cleanest way down Bar Pot. It is, however, more fun and more challenging than the trade route, as well as providing a fresh insight into the complexities of a classic Yorkshire system.